LOCAL: Svetlana Bigayeva and Kira Morav work at a gas station outside Zapolyarny. Bigayeva believes local processing of border certificate applications is the way to get more people to apply. Pechenga district has 37,500 inhabitants. Only five percent of them have border certificates. Svetlana Bigayeva and Kira Morav sell diesel and gasoline to Norwegian border residents at the gas station on the outskirts of Zapolyarny. They do not travel to Norway, although. Is it like getting in touch with the Norwegian guests or they just fill the fuel, pay and leave? “Oh yes. We have many regular customers who drink coffee and have some snack while they are here. We talk to them and get acquainted so that later I greet them as I meet them on the street,” Svetlana Bigayeva answers. What do you think Norwegian politicians should do to make more Russians come to visit? “Establish a visa center here in Zapolyarny or in Nikel,” Svetlana Bigayeva answers. Since 2012, residents in the Norwegian-Russian border areas, namely parts of southern Sør-Varanger and the entire Petchenga municipality, are able to visit each other without a visa but with a border certificate. A border certificate must be renewed every three years. On the Norwegian side the entire process can be fixed in Kirkenes where Russia has a Consulate General. Russians must drive to Murmansk to arrange documents and record biometrics, fingerprints. The ready certificate must be retrieved on-site, which can be done by the applicant’s authorizing as well. In distance, the road from Zapolyarny to Murmansk is 160 kilometers and from Nikel to the county capital it is 186 kilometers. So it’s evident why so many of “people in the street” in the nearest neighboring cities to Norway have never crossed the border. Random people in the street I’m talking to have different explanations why they do not travel to the neighboring country. There may be employment in the military, quarantine by employment, poor economy, lack of foreign passport, debt ratios implying they are not allowed to leave the country, Kirkenes being an extremely boring place - or that they have not had time or opportunity to fix the documents. SANKTIONS AS A BENEFIT: Edvard Losev, Sergey Sorokin and Roman Karatsupin build the church in Zapolyarny. “The sanctions can give us more independence from Europe”, says Sorokin. 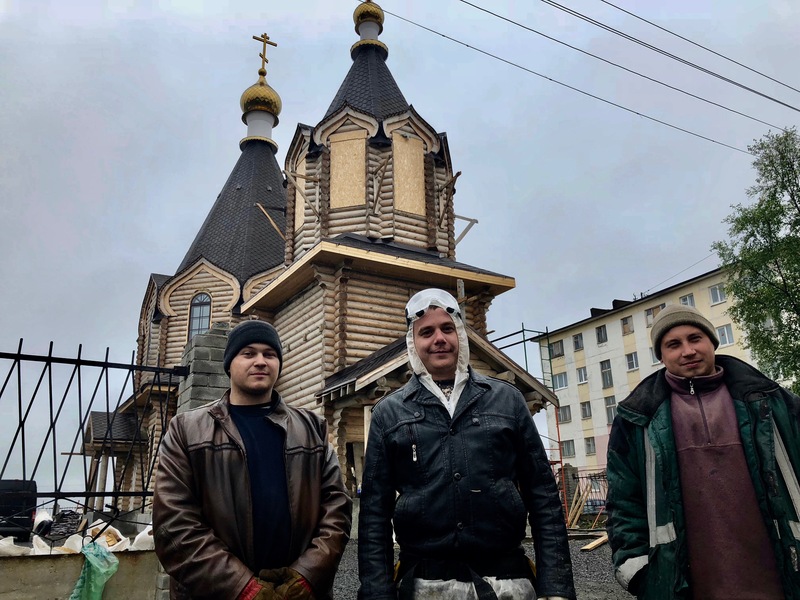 Edvard Losev, Sergey Sorokin and Roman Karatsupin take a little break from the work of constructing the new church in the central part of Zapolyarny to answer my questions. None of them have been in Norway for various reasons. But it has nothing to do with the political situation. “The sanctions do not affect us, and it may be even better with the sanctions because we get more independent from Europe,” says Sorokin. 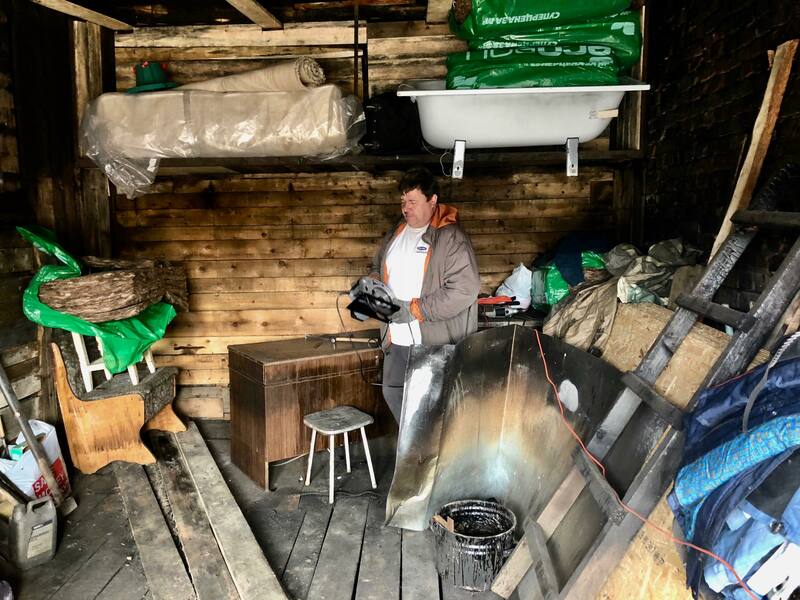 At the garages in the neighboring town of Nikel, Andrey Antilov is to clean and sort out the mess. Because you want to support Russia? “Yes, I do. But actually it’s just because this is where I am,” smiles the gentle mining worker. “If I were to travel to Norway, I would have to get a visa or border certificate. But I am working when they are open and when I’m free they have it closed. Do you have a lot of Norwegians to encounter? Andrey Antilov lives in Nikel where he has his garage. Do you think the mood between people has changed following spy stories and sanctions? 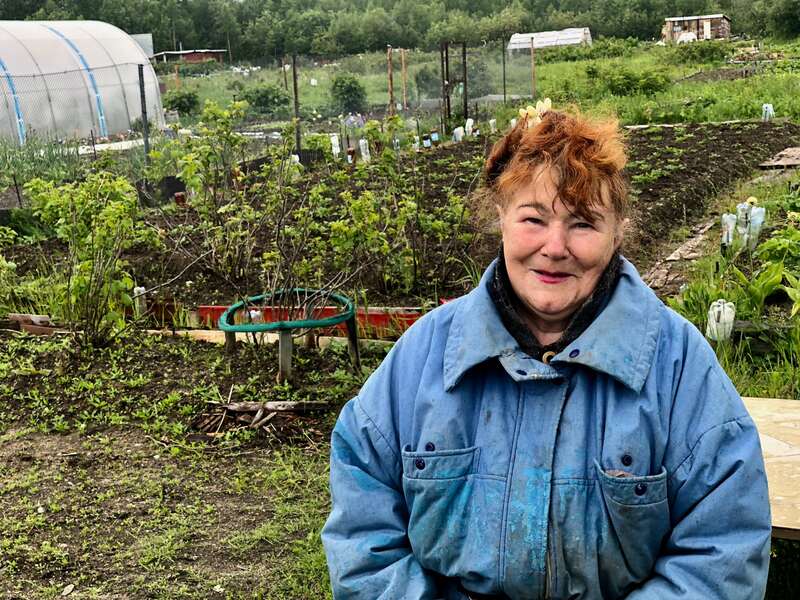 In the allotment gardens in Pechenga, just like in the area where Norwegian border residents are still allowed to move, there are few people in a day without two-digit heat and with some rain in the air. But Nina Alekseyevna (83) is there and potters around the garden. “Oh, so nice to meet a Norwegian. Now I’m happy,” Nina smiles. She takes my hand and kisses it. Nina is from Smolensk, and came to Zapolyarny in 1962. She had to be with the brother and build the city. “Oh yes. Of course,” she laughs. “It’s hard to talk about the war,” she says. I’m sorry for bringing the memories to you! PERFECT WITH CONTACTS: Nina Akeseyevna knows there is danger of ferocity when the war starts. She has seen the war and knows peace is better. On Norwegian side, Hugo Dalmeyer Nilsen sits. 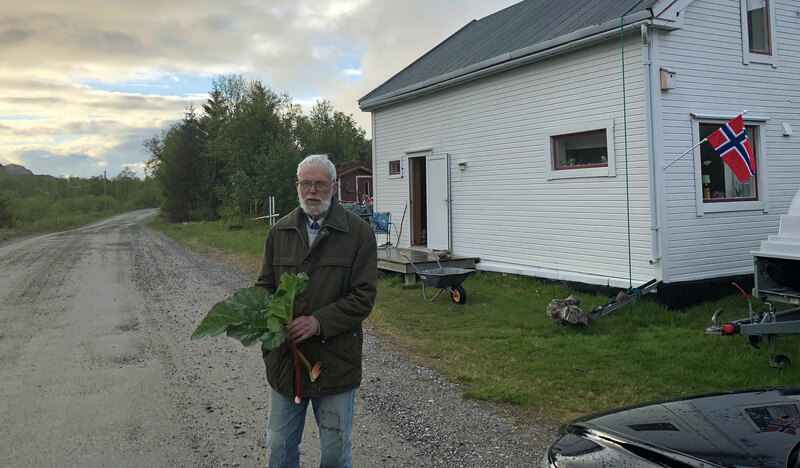 He looks out of the kitchen window in Grense Jakobselv, a stone throw away from Russia, saying that he once had a border certificate, but hasn’t renewed it. “The first time I was in Russia was five years ago,” he says. When Hugo was little, they bathed a lot in the river. What do you think about the situation between Norway and Russia now? HASN’T UPDATED: Hugo Dalmeyer Nilsen did not renew his border certificate. They say the borders have become more open now, but in Grense Jakobselv you are not allowed to go where your ancestors picked berries and fished. Norway’s Consul General in Murmansk, Erik Svedahl, says he does not think it would be possible to arrange a visa center in Zapolyarny or Nikel because the actual text of the cross-border agreement between Norway and Russia states that border certificates must be issued in Murmansk. In case of renewal of the border certificate, the applicant must show up again at the visa department in Murmansk. The reason is that biometrics can only be stored for a month. Norway has wished to open the Honorary Consulate in Nikel, which has not been realized. “And yet this would not be a kind of issue a honorary consulate could handle,” points out Svedahl. In total, Norway has issued 4012 border certificates since the treaty entered into force in 2012. As of May 15 2018, 1800 were valid. In the beginning of August another 100 were issued, but logically enough also some have expired by the date. CONSIDERS WORKING SATURDAYS: The Norwegian Consulate General considers to hold the visa department open on Saturdays in order to attract more applicants. The Norwegian Consul General describes that there was a completely different climate in 2012. There were hope and expectations for Shtokman and Norwegian participation. A total of 40 Norwegian companies operated in Murmansk. Now there is only a couple remaining. Svedahl believes that sanctions against Russia and counter-sanctions do not affect the motivation to cooperate across borders. “No, up here, at regional level, one is more concerned with the closer things,” he thinks. Previously there had been an attempt of local reception of applications for border certificates in Zapolyarny and also with Saturday opening hours at the visa department in Murmansk. Is Norway in fact making obtaining border certificates as difficult as possible as a way to maintain a “fence against the Soviet”? “No, the very point of the Barents cooperation is to open the border. We want people to get around and stay more familiar. Maybe it’s a complicating factor, but I think those really interested in obtaining a border certificate or a visa will succed. Nonetheless, I think we will try to have Saturday opening hours again. We’ve done it before and I want to try it again,” says Erik Svedahl. The Norwegian Consulate General does not have any overview of how many of the 37,500 inhabitants in Petchenga can be qualified to apply. Russia has issued 7419 border certificates since the cross-border agreement was introduced, according to Russia’s Consulate General in Kirkenes. 3375 of these are valid now. On the Norwegian side, about 9700 can apply. This is the first in a serie of articles with focus on life and contacts in the Norwegian-Russian borderland in the north.